Getting married in the "Upper Valley?" There are about 20 inns and bed and breakfasts in the greater Woodstock and Quechee areas. In addition, you can sometimes find accommodations through Quechee Lake. Our recommended inns and B & Bs are listed on this site. If you decide to book a room, please tell the innkeeper(s) that you found them through Quechee-Village.Com. Accommodations during the tourist season can be difficult, especially during Dartmouth homecoming, the Covered Bridges half Marathon and the Quechee Balloon Festival and Crafts Fair. 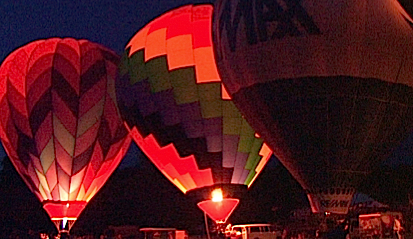 See a our Video-Vermont Balloon Glow from the Festival followed by an early morning launching of the balloons over Quechee. If you can't find anything available in the immediate area, you might want to consider neighboring Lebanon, Norwich and even Windsor. Consult our main listing site on Scenes of Vermont. Another festival worth attending is the Scottish Festival held on the Quechee Polo Grounds at the end of August. See our slide shows and videos of this event here.